How many of y'all used to pour over the pages of Victoria Magazine? I know I did for years!! And suddenly... it was gone!!! Alas!! I read today that in October of this year, it is making a reappearance!! Yippee!! I'll definitely be waiting in line at the newsstand to get a copy!! Oh!! You made my day. I loved that magazine. I'll be right there with you, Mrs. U! I'm so excited! Your Elizabeth is beautiful. What a charmer she is. This is my first visit to your blog. I wanted to thank you for your sweet words on my site for our Abby. I enjoyed my visit here. I love your idea for sending supplies to the orphanage in China. What a very loving gesture. It will be so appreciated. That is Awesome! I had been a subscriber to that magazine from 1987 until it folded. I've been reading "Romantic Homes" in "Victoria"'s absence. Hi! I am stoppong by via Amy's Random Thoughts contest to tell you hello for her ;-) I enjoyed your blog and hope to visit again soon! /have a wonderful day! Had to stop by and visit after the great comment you left me last week. Sorry I'm getting around so late; I had major surgery 5 weeks ago and I'm still not back up to speed! 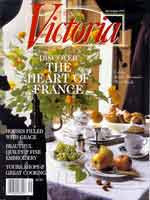 I loved Victoria magazine; so glad to hear it's coming back. Your blog is fabulous; I really enjoyed browsing through your posts. I will definately be back! You can subscribe early to the new Victoria!! !